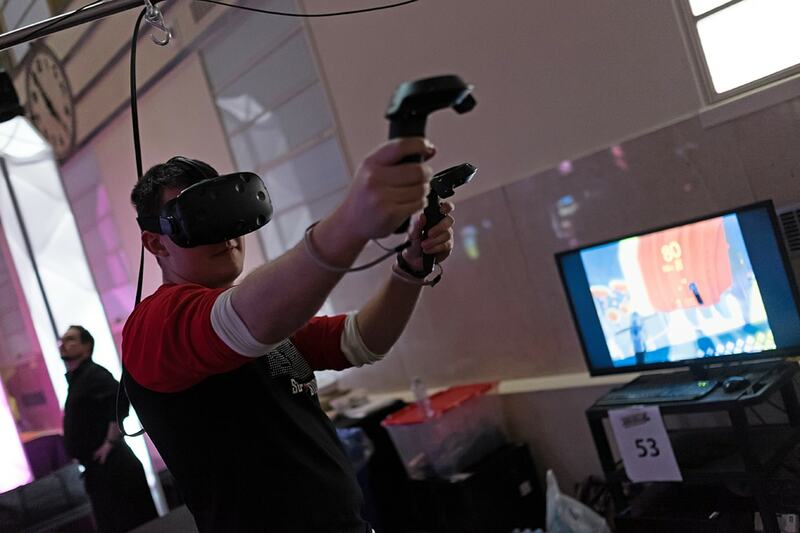 After months of developing video games in collaboration with OCAD U students, U of T computer science undergraduates had the chance to show off their creations and get feedback from industry pros at the Level Up Showcase. Organizers said about 2,000 people attended the event at the Design Exchange in the Financial District on Wednesday. Steve Engels, an associate professor, teaching stream in U of T's department of computer science, co-founded the event with Emma Westecott, an associate professor in OCAD U's Faculty of Liberal Arts and Sciences, seven years ago. Students from another U of T class in mobile game development, taught by sessional lecturer Elias Adum, were also on display. Their games were designed with Centennial College students. Neon Ascension, an arcade game with a Tron-like aesthetic, was developed by U of T's Grace Zhu, Philip Bilodeau, Jeffrey Deng, Catherine Wang and Daniel Son and students from OCAD U. The goal is to outlast the opposing player on an endless climbing wall. The players rearrange blocks on the wall to stay alive while trying to sabotage their rival. One aisle over, computer science undergrads unveiled a completely different project: an exploration and puzzle game called Sizis in which players must grow or shrink objects to advance through a fantasy world up in the clouds and collect relics. All evening, judges who work in the video game industry tried out the students' projects, ranked them and provided feedback. In 2015, Pitfall Planet, designed by U of T's Daphne Ippolito, Alexander Biggs and Adam Robinson-Yu, won the award for best overall game. But it was not meant to be for U of T teams this year. The night's big winner was Disco Is Dead by students in Sheridan College's first graduating class of the bachelor's game design program. Players fight off the undead by slapping zombie head-shaped controllers and execute special team moves by high-fiving while holding a disco ball shaped controller. The game won for best overall, best tech and best art.